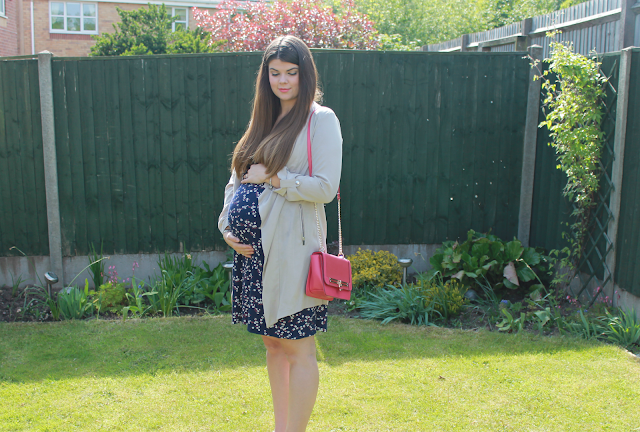 Looking at the Maternity dresses on M&Co's website, I came across this gorgeous Floral Print Tea Dress* by Heavenly Bump which I thought would be perfect! Straight away I contacted them about the length, hoping that it would be long enough and I was so happy when they replied with the measurements. At 99cm from shoulder to hem, this dress is the perfect length for me, ending just above my knees which allows me to feel comfortable yet reassured, lets face it, when your pregnant, granny pants are most comfortable and nobody wants to see my granny pants! When the dress arrived I immediately tried it on and I didn't want to take it back off! What I loved the most was just how comfortable this dress is, the lightweight material is so nice and soft with a waist tie that allows you to the pull the dress in just above your bump, accentuating your figure without any restrictions. This for me is important as my hourglass figure has always needed pulling in at the waist even before pregnancy to stop me from looking larger than I am, so I find this dress really flattering. Saturday was surprisingly sunny and warm, which is always a pleasant surprise and I was going out shopping for the day, I needed something easy to wear that I could take on and off quickly when trying on clothes but something stylish as we were out out for lunch too and I knew this would be the perfect opportunity to take the dress on it's first outing. To style this for the gorgeous Spring weather, I opted for a lightweight kimono, white sandals and pink bag for a pop of colour. The kimono is perfect for covering up your arms, if like me you don't like yours on show but is so lightweight that you wont get too hot in it and the wide fit sandals are perfect for pregnancy swollen feet, at only £7.99 you might be able to justify picking them up in a few colours. I opted for delicate jewellery as I didn't want to clash with the pattern of the dress and the colour of the bag, I also took my New Look Waterfall Blazer as English weather is often temperamental and I didn't fancy getting caught without one. being one of those fail safe 'wear for every occasion' summer dresses! Have you checked out M&Co's Maternity section yet? What is your go to for maternity wear?